Admittedly, I don't get a lot of opportunities to review literature for kids. The occasional YA novel? Sure. Most of what I read for review, however, falls firmly within the "not marketed to kids" category (since "adult" means something else here). This review may expose some of my weaknesses when it comes to this particular field, as N.D. Wilson's Boys of Blur is certainly embedded in a tradition about which I am not as familiar as I should be. Regardless, I will tread honestly here in hopes that I can offer some insight into this particular novel. Boys of Blur takes place in my state of residence: Florida. Specifically, it is set in the fictional town of Taper (near "Muck City," a.k.a. Belle Glade), deep in the everglades, where nature is often stranger than the people that live there. That's certainly true of this novel. When Charlie and his family visit Taper for a funeral, his stepfather, Mack, is offered the head coaching job at the local high school, which at one time was known for its fair share of decent players. But Taper is a place of worry and concern for Natalie, Charlie's mother, who left Taper after divorcing Charlie's abusive father, Bobby; it also holds worry for Charlie, too: after befriending his cousin, Cotton, Charlie discovers something wicked living and growing in the swamps. Something evil. Something that wants to take Taper for itself. And it might just be up to Charlie to stop it before "it" and Taper's residents tear themselves apart. Astute readers will recognize some clear parallels to Beowulf here (or, perhaps, its amusing Norse-style adaptation, The 13th Warrior (1999)). Much of the novel's supernatural elements are of the form commonly associated with the classic epic, which are less direct and more boiled down to a template: monster threatens town, boy seeks out monster, and boy defeats monster (I'm leaving out a few details to avoid spoiling things). In fact, one of the things I loved about Boys of Blur was the way it courted the supernatural in order to provide a semi-bildungsroman with Beowulf as its center. 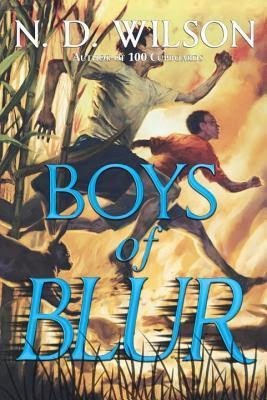 Indeed, from the almost zombie-like creatures that terrorize Charlie and Cotton to the deterioration of Taper as a community to the interesting commentaries on the nature of life and death, Boys of Blur seems like a perfect gateway for young readers who might be curious about the classic epics. I must also admit that I personally enjoy renditions of this story type that opt for a darker vision. Wilson certainly has an eye for the creep-factor. Though some younger readers may find the novel a little terrifying, many will surely be gripped by the macabre nature of the novel's horror. When the novel is focused on its supernatural elements, it is at its strongest. Wilson doesn't always offer the level of explanation I would want, but he does thrust his young protagonist into a bizarre and often confusing world of things that shouldn't exist. Even the "good guys" are sometimes as creepy as the bad ones, which gives the supernatural a distinctly discomforting feel -- there is no cutesy here. Wilson also does a fine job of presenting a narrative arc for Charlie that leads to modest, but largely positive changes. Charlie's family thrusts the reader into an awkward situation (albeit, more so for younger readers than adults): his mother has remarried a supportive man who Charlie seems to accept, but doesn't fully embrace at the start (a stepfather subplot bonus). They are a mended family rather than a traditional nuclear one. This gives the novel an endearing quality, as it tries to court both its fantastic major plot and its family-oriented subplots in different forms: the former directly and the latter in a more nuanced, deliberately withdrawn sense. Charlie, after all, is twelve, and so what he understands of adult relationships is less pronounced than his understanding of good and evil. Even Wilson's handling of sports culture in small-town-America adds depth to the narrative -- this coming from a reader who is bored stiff by sports-heavy sf. I half expected this book to be reduced to its major plot, discarding any complicated and sometimes difficult material entirely. But Wilson doesn't do so. Much like Holes by Louis Sachar, which the cover blurb uses as a comparison, this is a novel with a deep underbelly that offers food for thought, even if Wilson does pull his punches in places. The epilogue, thus, serves as a positive conclusion to much of the novel's subplots and gave me a sense that Charlie had not simply survived something horrifying, but had also come out of it with a renewed vigor. This is, I suspect, fairly normal in books for young people. That said, there is one main concern I had with Boys of Blur. While the narrative deals explicitly with domestic abuse from the perspective of a child, I think Wilson does so by limiting a deeper discussion of that issue. In particular, the book itself provides little in the way of a resolution for this element, almost as though Charlie should have been too young to understand what has already transpired between his father, Bobby, and his mother, Natalie. But Charlie is twelve and seems to understand what has happened in his family, even if he was too little to understand when his parents had divorced. In the end, no significant conversation is had about Bobby, who is undeniably a violent abuser who has shown no real reform, and his involvement in his son's life, despite the fact that Bobby appears to threaten Natalie in the novel. Charlie does take a stand against Bobby, and the novel try to address the issue, but this is brief and largely forgotten. If Wilson intended the concluding moments to be one of "going to bed with one's enemy to conquer a greater foe," then he needed to do so with a more deft hand; likewise, if he intended these other mentions of Bobby's past and his abusive nature to be either partially redemptive or even an attempt to nuance an abuser, I think he missed the mark entirely. Here, I think the novel does more to reinforce domestic abuse as "not a big deal" than it does to address a child's perspective on such things. Overall, I quite enjoyed Boys of Blur. Though the novel has a few problems in terms of its representation of controversial subjects, it is an easy and fairly gripping read. From its spine-tingling creepiness to its Beowulf-ian nature, this is a book that young kids will certainly enjoy. Side note: this is the first Florida-based book I have read that really captured what Florida feels like to someone who hasn't lived there their whole life. A bonus for anyone worried the setting will alienate readers (nope). : Itself an adaptation of a Michael Crichton book. : Admittedly, Bobby does come off as creepy as the supernatural creatures Charlie is forced to fight. I'm just not convinced that the novel intended this as a metaphor for the distance between father and son (due to former abuse). Perhaps I'm reading too much into this, though.